and getting my squeally girl voice ready. Okay, well first I am working on getting to feeling 100 percent. I have a week to prepare myself for an evening with Morrissey. Isn't he a dreamboat? My dear friend Genevieve is turning the big 30 next week so we are taking a road trip to Florida to see the man in concert. So, this here blog is going to be dedicated (for the next week) to what I like about being in my 30's. So get ready to celebrate friends. Hooray for getting older and wiser. Morrissey is a total legend. Hope u and your friend have a great time, v.jealous! I can't wait for more instalments! 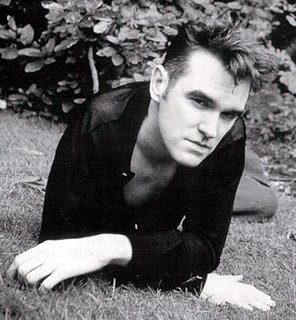 I have to admit Morrissey still does it for me. I guess years of looking at his huge poster on my home bedroom wall doesn't leave you. Have so much fun, I'm jeleous. I saw him in um...'92. here's to morrissey, squeally girl voices, road trips to florida, and creeping cautiously towards 50. you all are still teenagers! definitely hooray to getting older and wiser. have a blast! Fun for you! I'm excited to read about what you like about being in your 30s. I've like my 30s too.